While my previous walks along the paper trail have focused mainly on olfaction, my ultimate goal is to study taste perception. Since the last few walks have been about olfactory receptors, I figure it would be natural to transition to taste receptors. Unlike olfaction, where it is difficult to correlate percepts like "floral" or "rotten" with individual receptors, the correlation is much easier for taste perception. Taste receptors have been identified most of the major taste percepts: sweet, bitter, salty, and umami (there are some additional receptors for properties like carbonation and water, but those are considered secondary). 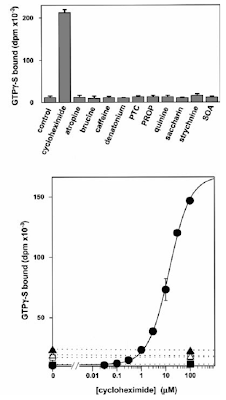 The receptors for sweet, bitter, and umami are all G-protein coupled receptors (GPCRs), while sodium is detected by ENaCs. 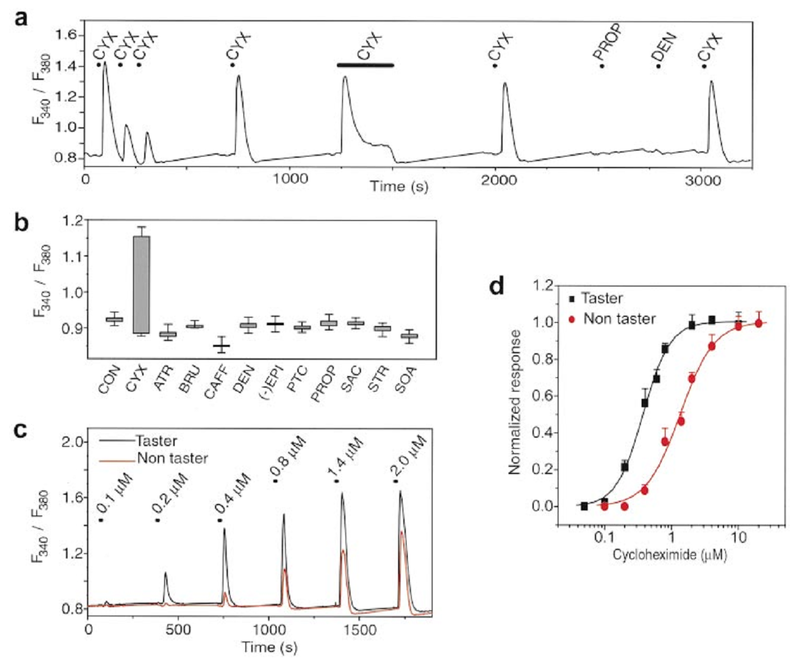 The one percept that remains somewhat elusive is sourness, where a TRP channel PKD2L1 and a carbonic anhydrase CAR4 which are expressed in sour sensing taste cells, but the full mechanism remains unclear. Given that background, today I'm going to (read and) review the first paper to report taste receptor activation. The bitter receptors (T2R) were reported almost simultaneously by the Buck and Zuker labs in March and April of 2000 (I bet there's an interesting story of that race somewhere). Besides listing a bunch of receptors, these papers also found that bitter receptors are all coexpressed in the same cells, and that there is no receptor pattern on the tongue. The Zuker lab also published an accompanying paper by Chandrashekar et. al. where they showed that individual receptors respond to different bitter compounds. 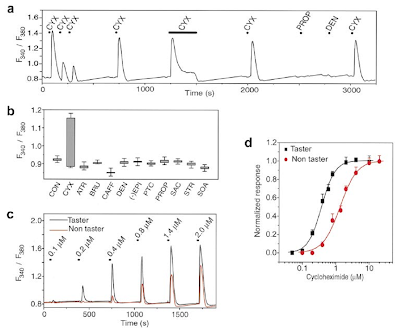 For Chandrashekar and colleagues to study the T2Rs, they needed to establish an in vitro system, but given that they just discovered the receptors, they didn't know the downstream signaling proteins (at least until the end of the paper). 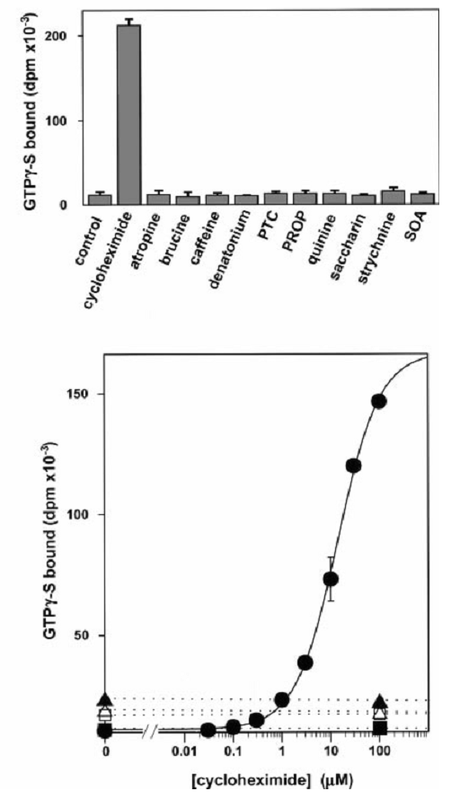 To get around this they used a G-protein which binds to a broad range of GPCRs, Ga15. They then expressed individual T2Rs with Ga15 in HEK-293T cells and measured the calcium response following tastant application. Using this system, they screened a random set of human, rat, and mouse T2Rs against a set of 55 tastants. From this entire screen they reported three responsive T2R-tastant pairs. (They surprisingly don't report this entire response profile. And it's not like supplemental info didn't exist in 2000.) The pair they focused on is mouse T2R-5, which responds selectively to cycloheximine (panel b, below). mT2R-5 responds to cyclohexamine. From Chandrashekar et. al. 2000. They "characterized" the response as having a fast rise time of <1s, which desensitizes within 10s (panel a, above). They also noted that repeated application of cycloheximine caused smaller Ca2+ rises, showing there was desensitization. Thirty years ago, researchers found that different strains of mice have different bitter sensitivities. For example, C57 mice don't avoid cyclohexamine while DBA/2J mice do. Chandrashekar sequenced the mT2R-5s for multiple strains of mice, categorizing the receptors as "tasters" (from mice which could taste cycloheximine) and "non-tasters." The non-taster mT2R-5s had three mutations, including a missense mutation, and when they transfected HEK cells with the non-taster mT2R-5, they found it had a lower sensitivity to cycloheximine (panel d). In the final section of the paper they fingered gustducin as the G-protein that couples to T2R. To do this they used a cell-free system, using membranes with mT2R-5, and measured how much gustducin was bound to the membrane. They found gustducin selectively bound to mT2R-5 in the presence of cycloheximine (top panel), and the Kd of the system was similar to what they found in HEK cells (compare panel b below to panel d above). Gustducin (GTPyS) binds to mT2R-5 in presence of cycloheximine. From Chandrashekar et. al. 2000. And that's the paper. It's still kinda shocking to me that it took until the year 2000 for just a subset of the taste receptors to be identified. They're right there, on the tongue! I also appreciated the cleverness of using Ga15 to allow them to record tastant responses (although this trick may be standard in molecular biology). One problem I have with this paper is that it does not seem very... thorough. For example, they did not report all their tastant-odorant responses, and from skimming Zuker's later papers they did not report them there either. Or when they characterized the response, they didn't report a tau for the on or off phases. I realize these numbers may not be completely accurate, but I still want to know them. My legs are a bit tired from this trek, so I'll stop here. There's a lot more to know about bitter receptors, for example many people have looked at how different polymorphisms in mammals can effect perception. But that is for another time.